The MAB is a non-profit 501(c)(6) organization representing commercial radio and television broadcast stations in Michigan. MAB is governed by a Board of Directors and operated by a staff based in Lansing, Michigan. Karole L. White is MAB’s President and CEO. 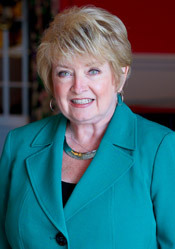 Prior to joining the MAB in 1985, Ms. White was the Executive Vice President Director for the Michigan Floral Association, the Executive Director of the MFA Health Insurance Trust, the managing director of MFA Federal Credit Union and President, Executive Director MAB Floral Service Inc. White has been in Association Management in the Greater Lansing area for over 30 years. She has served in executive positions with the Michigan Funeral Directors Association, United States Cheerleaders Association, Muscular Dystrophy Association and was a partner in BKM Advertising and Display Company. Ms. White received her broadcasting back ground through advertising as Marketing Director for Forbes Cohen Properties in Lansing and as Telethon Manager for MDA. She has been honored with numerous awards, including most recently induction into the Michigan Society of Association Executives Hall of Fame and the Citizen’s Medal of Honor from the National Guard. A life time learner, Ms. White attended Lansing Business University, Lansing Community College and Michigan State University.